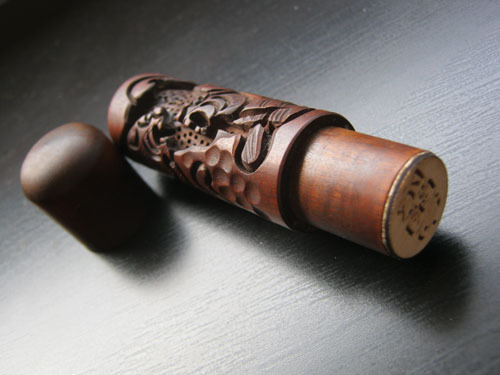 Over the centuries, seal-making has been practised by master seal engravers who, throughout their lives, devotedly worked on the perfection of this beautiful art. But there have always been calligraphers who carved their seals themselves. 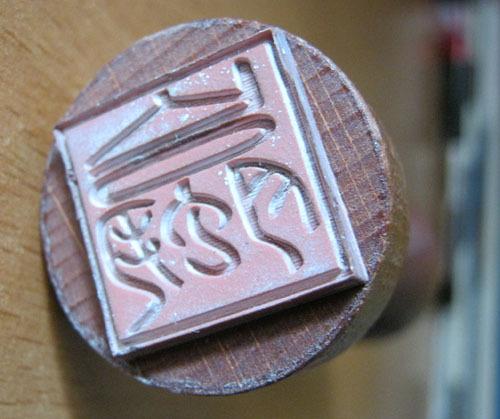 As there are practically no master engravers in Hungary, it is quite difficult for calligraphers to get hold of private seals. To solve this problem, I began working out solutions and started making my own seals. (Read more on seals I use here). 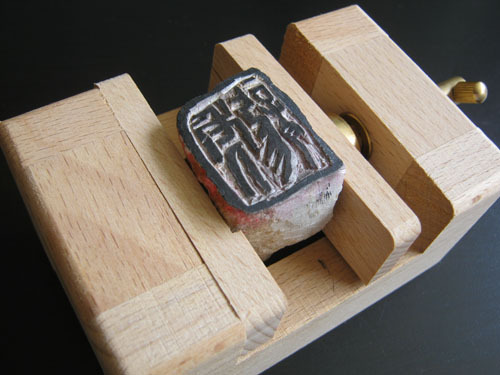 In this month’s issue of ICCPS‘ newsletter I have read interesting facts about Chinese seal stones. There is a great variety of stones used for seal making and it is useful to know what these are. For a long time seals were made of copper or jade, which were hard materials and difficult to carve. 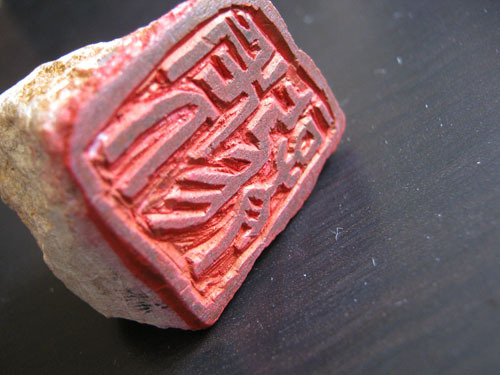 Later softer stones were used, the four most common of which are “The four well-known seal stones of China”. The first stone is the Balin stone （巴淋石）, a special, yellowish, reddish stone, not too hard and not too soft. It is produced in Inner Mongolia. 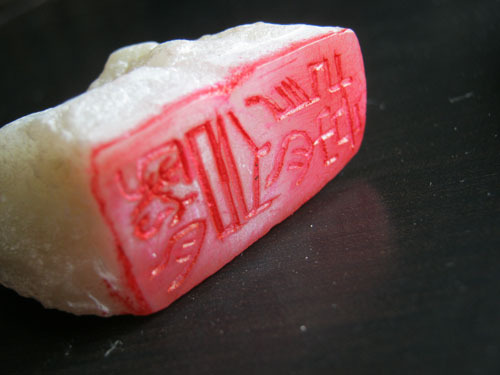 The second is the Shoushan stone （寿 山石) with a milky white colour with shades of yellow or red. Due to its pure texture and other qualities, it is considered the national stone of China by many artists. The best quality stones have a pearly, creamy colour and a greasy feel. They are produced in the picturesque village of Shoushan in Fouzan province. The third stone is the Qingtian stone （青田石）with a dense texture. It comes in a great variety of colours (yellow, red, green, blue, brownish, or a mixture of these). Due to its softness, it is easier to carve. It is produced in Qingtian county in Zheijang province. The oldest type of seal stone is also said to have been produced here. Finally, the fourth stone is the so-called Changhua stone （鶏血石） which can be red or grey, sometimes flecked with white dots. This stone has a greasy feel and a mild colour. 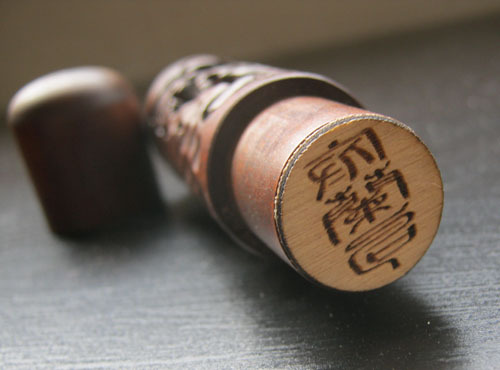 In Japan seals, inkan （印鑑） or hanko (判子) are essential to everyday life because they are used on all kinds of documents to replace signatures. Each seal is a unique work of art, carved out of ivory, wood or stone, with great care. 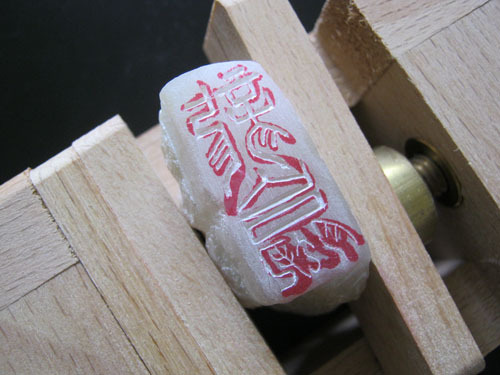 When we make a seal, we traditionally carve a name into it using “seal script”, an ancient calligraphy style. (For more on calligraphy styles and the seal script please click here). First we prepare the stone, polish its surface, write the kanji on it and then carve in the characters. This is how the below two seals were made. These two seals were made from soft talc. This stone is easy to carve and can be bought in many shops. Modern technology also helps us in making seals. After we draw the outlines of the text and process it digitally, we can apply it on any surface we wish, such as plastic or traditional seal rubber as shown below. There is an inexhaustible source of dictionaries and books available on seals, their material and the texts carved into them.